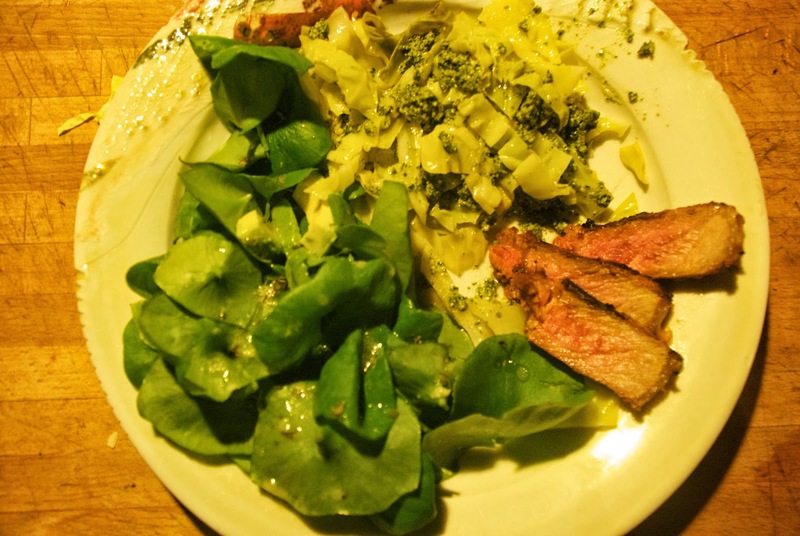 Tonight's dinner: Cabbage noodles with stinging nettle pesto, miner's lettuce salad with lemon-mustard viniagrette, and grilled grass-fed local beef with lime garlic rub...mmmmm. About a year and a half ago, I embarked on a new food journey. I wasn't happy with my health or weight, and someone recommended the blog of Maria Emmerich, called Keto Adapted. I did some reading, and was very intrigued with her perspective, and the results her clients claimed. So I dove in, headlong. The basic idea is to eat a high fat, moderate protein, and low-carb diet, and this is supposed to put your body in nutritional ketosis, a state where your body burns fat for energy instead of carbs. Maria's blog is full of delicious and delightful dishes, as well as keto-adapted takes on standards, such as stroganoff, or granola. It has totally changed the way I eat, and in general, I feel a lot better than I did when I began, and I lost about 15 pounds to boot. I've since then also explored the Paleo philosophy, and found a lot of really interesting reading about how humans are meant to eat and live. Recently, my daughter Ella has become fascinated with natural history and indigenous living traditions. She is curious about edible plants and mushrooms, and interested in how to build her own bow, wants to hunt animals with snares, make fire with a hand drill, and build debris huts and live in the woods with only a knife and a pot. Drew and I are so thrilled with this development, because we are both very interested in the same skills, and have each, on our own terms, spent time in our lives studying the natural world. Last year, Drew carved a trail through our unique and unusual swamp, that lies down the hill from the yurt. Before then, this area was impenetrable. Now, there's a quite pleasant little walk one can take, even with the kids. Yesterday, Drew and Ella did some woods clean up on part of this walk, and created the beginnings of a little wilderness camp, where Ella is planning to carry out her survivalist experience. Today, she wanted to go back down there to work on fire drills, and also harvest wild edibles. I'm always into that idea. We collected cattails tubers and stems from the marsh (Typha latifolia), though I'm actually quite inexperienced in how to make use of this plant. We then collected a large bunch of stinging nettles (Urtica dioica), and some miner's lettuce (Claytonia perfoliata) to use in our dinner. I also collected some chickweed (Stellaria media) because I wanted Ella to know the plant. While we were doing our walkabout, we managed to sneak up on some deer, who didn't notice us for a while, until our little dog dashed across the meadow! Once home, I steamed the nettles to prepare my nettle pesto, and cleaned the miner's lettuce and added some sliced avocado for a salad. I cooked up some home-grown cabbage "noodles" for my low carb noodle portion (Drew and the kids had regular noodles), made some dressing, and we grilled some grass-fed T-bone steak that was grown across the creek on our neighbor's land. Now that's "paleo". Mill the walnuts, garlic, and salt in the food processor until the walnuts form almost a paste. Add the steamed nettles, and pulse until well mixed. Add olive oil to create your desired pesto consistency. Add to the pasta of your choice and enjoy.